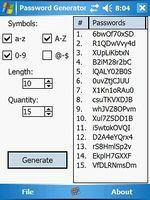 AQL Secure Password Generator (http://www.aqlsoft.com) allows you to create random passwords that are highly secure and extremely difficult to crack or guess due to an optional combination of lower and upper case letters, numbers and punctuation symbols. Features include: 1. Select the length of your password from 4 to 128. 2. Generate lowercase, uppercase, number or punctuation passwords. 3. 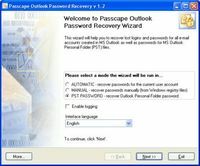 Copy password to clipboard. 4. Support for batch generating. 5. Save the passwords as a .TXT file. 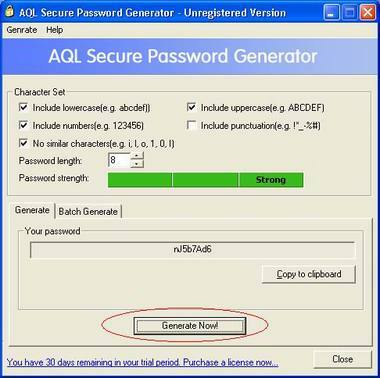 AQL Secure Password Generator is used by webmasters, system administrators, Internet service providers (ISP's) - anyone who needs to generate random passwords, user ID, security keys and login names. 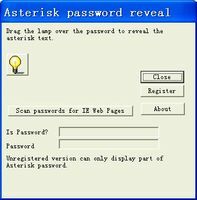 AQL Secure Password Generator ensures your passwords are impossible to guess.